Since 1980, Daniel R. Carter (“Dan”) has focused his practice in the area of civil litigation. He has represented individuals, small companies and large corporations in the areas of insurance coverage, commercial litigation (including warranty claims), construction law, employment discrimination (including sexual harassment), product liability and personal injury. Throughout his career, he also handled the probate of estates. Mr. Carter has spoken at several seminars on the topics of insurance coverage and commercial litigation. He is a member of the American Bar Association, the Litigation Section of the ABA serving on the Insurance Coverage Litigation Committee, the Construction Litigation Committee and the Business Torts Litigation Committee. He is active in the local and state bar associations. He has served as President and Secretary-Treasurer of the Pulaski County Bar Association. Mr. Carter was Secretary-Treasurer of the Arkansas Bar Association and served on its Executive Council for five years. He is a Master in the William R. Overton Inn of Court. He is a Fellow of the Arkansas Bar Foundation and served on its Board of Directors for three years. Mr. Carter received his Juris Doctorate from the University of Arkansas in 1980. He received his undergraduate degree and a master’s degree from Kansas State University. He served as a Legislative Intern in the U.S. Senate in 1975. 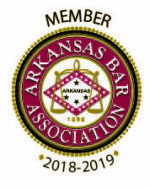 He is admitted to practice in all state and federal courts in Arkansas, the United States Court of Appeals for the Eighth Circuit and the United States Supreme Court. Mr. Carter is AV rated, the highest recognition awarded by Martindale-Hubbell for legal experience, skill, integrity and professional excellence. Membership: Pulaski County (President, 1991-1992; Vice President, 1990-1991; Secretary-Treasurer, 1984-1988), Arkansas (Secretary-Treasurer, 1996-1998; Member: House of Delegates, 1987-1990, 1991-1994; Executive Council, 1989-1992; 1996-1998; Committee for a Modern Judiciary) and American (Member: Litigation Section; Insurance Coverage Litigation Committee; Construction Litigation Committee; Business Torts Litigation Committee) Bar Associations; William R. Overton Inn of Court (Master); The Association of Trial Lawyers of America; Arkansas Trial Lawyers Association. Reported Cases: Unigard Security Ins. and Employers Surplus Lines Ins. Co. V. Murphy Oil USA, Inc., 331 Ark. 211, 962S.W.2d 735 (1998); Robinson v. Sears Roebuck & Co. 111 F.Supp 2d 1101 (E.D. Ark 2000). Miscellaneous Information: Phi Alpha Delta. Legislative Intern, U.S. Senate, l975. Member, Pulaski County Law Library Board, 1988-. Fellow, Arkansas Bar Foundation (Board of Directors, 2002-2005).